I speak about social media, the digital world, leadership and how this ‘new’ connectivity is impacting our lives. Other topics are how to be seen as a leader online and digital leadership. When I work with you as a speaker at your event, I will tailor and craft a content rich keynote speech or masterclass. What I share must be relevant to the audience, and your industry. Social media and digital technology move fast – and so does my mind. As a social media speaker, I am often including my new ideas, thoughts and reflections on the topics. In my talks and workshops, I incorporate my experiences, business case studies and academic research about the topic. At university I studied behaviour science and organisation and leadership, these are still my favourite topics together with technology and the internet. Occasionally, I compere events and panels of experts in digital media. My experience working with digital and social media is very helpful when acting as emcee at this kind of event as I can ensure that the audience understands any technical language used by the speakers. 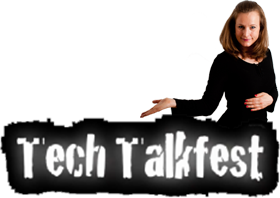 I’ve done two TEDx talks a few years back. You can watch them here: 1) TEDxUCL and 2) TEDxWomen, and also read the transcript. Last year I spoke at a lot of digital marketing and social media events. I noticed a tendency that worried me. Many people were approaching me after the talks and sharing that their work had become far too stressful because of omnichannel and multichannel marketing strategies, plus that conflicts and lack of creativity made them exhausted. Leaders and managers who are not aware of how to organise people, time and resources are making the people I spoke to feel miserable. This, combined with the fact that I was working on a set of standards to prevent digital stress, prompted me to put together a new talk. The talk focuses on collaboration and leadership to enhance the working environment of teams that are influenced by the shift in digital technology. We are just in the beginning stages of technological development and technology is going to make everything more complex. Collaboration, the ability to improvise and leadership are all important elements in coping with future changes. 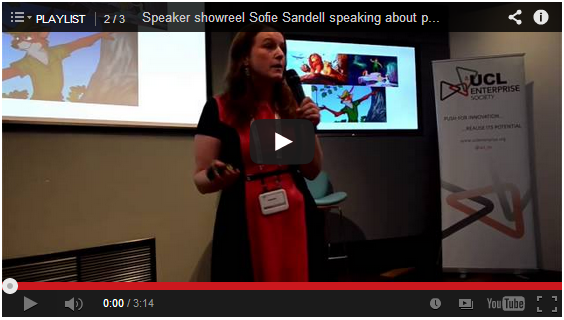 If you would like to hire me to speak about this topic get in touch at sofie@sofiesandell.com. 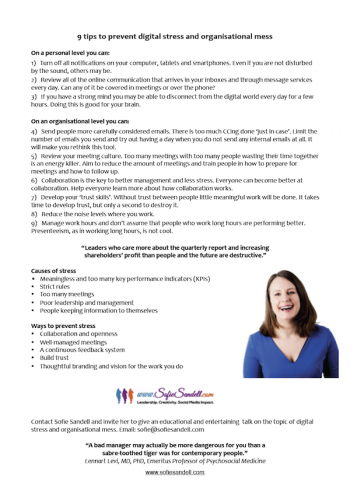 Download a PDF for nine tips for better collaborations by preventing digital stress and organisational mess. PS. I would NEVER recommend people to mediate stress away, or that a bit of mindfulness will solve all your problems. Find your passion and how to get noticed in social media. London, December 2015. Social media, Thought leadership and social media, London, November 2015. The future of mobile and social media. London, November, 2015. The 5th evolution of digital marketing conference. Keynotes about Personal Branding in B2B, Digital Leadership and part of the panel for a discussion about how to use video marketing in B2B. Shanghai, China. July 2014. Learning From Experience: Business Challenges & How To Overcome Them. Institute of Directors and JCI Liverpool. July 2014. How to build your community through social media. We Kollective, London, July 2014. Is Online Learning the Future? – Google Hangout – June 2014. 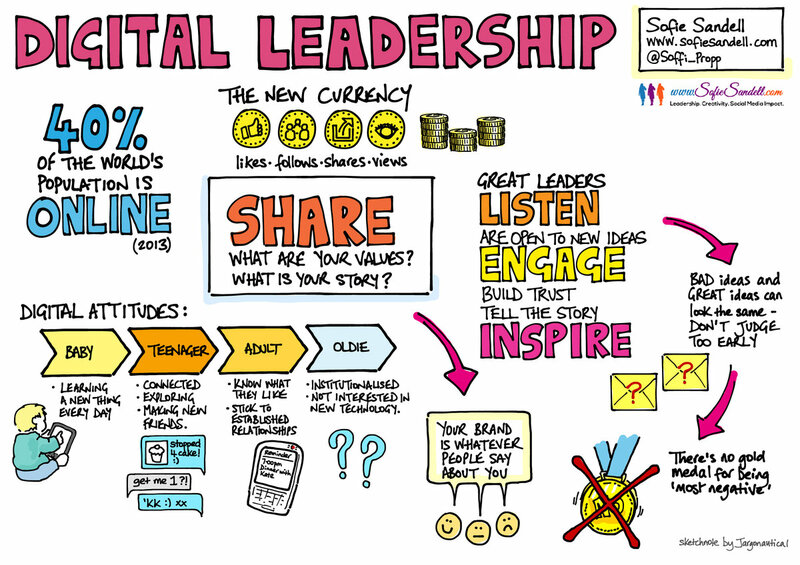 How to become a Digital Leader – a JCI London event and Q&A. June 2014. Barclays London: ‘The Digital Revolution and Telecommunications in Africa: Opportunities and Challenges‘, June 2014. Keynote ‘Digital Inspiration’ focusing on going back to basics and how to avoid the online mess, at Handheld Business Partners Conference in Stockholm, May 2014. I read magazines, books and blogs and attend a variety of talks and masterclasses held by experts to keep up-to-date in the areas I speak about. I provide knowledge in the form of talks and training and the better I can interact with my audience the better the experience will be for them. I am always developing my skills as a speaker by learning new ways to tell my stories as well as how to better use my voice and improve my presence onstage. All of the case studies I use in my presentations have been designed by me and I change my content depending on my audience. When preparing a case study I speak to the relevant company managers or their employees to make sure that I get an insider’s perspective. I am an independent speaker and I do not sell products or services for any other companies. If you (the client) act on the information passed on to you, you do this at your own risk. You can listen to a radio interview with me at ‘Dream Corner’ to learn more about my journey, career and life. Testimonials and comments about my speaking, talks and workshops. Please send an email to hello@sofiesandell.com. To make sure that I understand what you would like from me as a speaker I speak with both the event organiser and the compare/emcee before the event. If I am invited as a panellist or expert it’s always best if the emcee and I speak and get to know each other a bit better prior to the event. When an emcee does not get the background information they need they will not get the best out of their panel and the audience will be deprived of the kind of discussion they could have enjoyed if the emcee and panel had been better prepared. Depending on the structure of the event you may be able to ask your audience in advance if they have any specific questions. If so, I can either incorporate the questions into my presentation or I can do a prepared question and answer session at the end. I may use slides to enhance the key messages in my talk. The slides for some of my past presentations are available for you to look at on SlideShare. All slides form part of my stories and the information I share, so reading them will not provide a full picture. The slides are animated and help the audience to understand the message better. We live in a visual world and good slides help an audience to get more out of a presentation. Time management is crucial during events and I cringe when speakers run over their allotted time. I seem to have a built-in clock and so far I’ve never overrun when speaking. I care about the audience and it’s important for me to know who they are before I speak. Please share as much information with me as you can about the audience prior to the event. This will help me to focus my content and energy on the right areas. If I am working with you on a full day conference I prefer to be there all day to make sure I can link the content of my talk with that of the other speakers. I also take the time to interact with the audience and other speakers during the day – I understand that people are there to network and build relationships as well as to learn from the speakers. I always ask the audience what they thought about my presentation and interaction on stage. Seeking this feedback is one way I improve myself and my skills as a speaker. Sketch from one of Sofie Sandell’s talks. Why do I choose to speak all over the world? My choice to be an international speaker was inspired by my curiosity. Speaking in other countries is an adventure. You come face-to-face with new cultures, new people and new challenges. I used to work as a management consultant and every week I learned about different problems and issues that businesses were having. I do the same now, but I focus on the digital dimension. And trust me, many businesses have huge problems confronting the challenges of digital technology. One of the big benefits of being an international speaker is that you see social media and communication from different perspectives. You learn a hundred new things every time you interact with people and companies abroad. It fits me perfectly! Lecturing at INSEEC University in London 2012 – ongoing. I am managing and developing four courses. I talk about my courses here on YouTube. How to build your community through social media. We Kollective, London, July, 2014. Is Online Learning the Future? – Google Hangout – June, 2014. 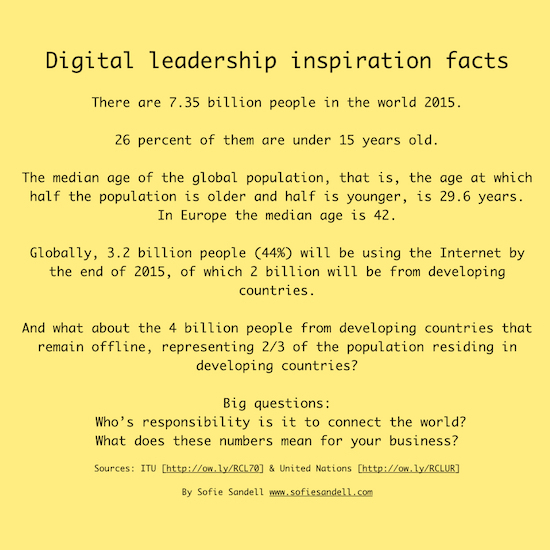 How to become a Digital Leader – a JCI London event and Q&A. June, 2014. Barclays London: ‘The Digital Revolution and Telecommunications in Africa: Opportunities and Challenges‘, June, 2014. Masterclass 2-days: Advanced Social Media. Edinburgh, Scotland. May 2014. Keynote talk at the The 3rd Arabian Social Media Forum. Topic was Digital Leadership – How to communicate your brand values using Social Media. Kuwait, 7th May 2014. Google Hangout: How to Survive an Information Tsunami’. April 2014. 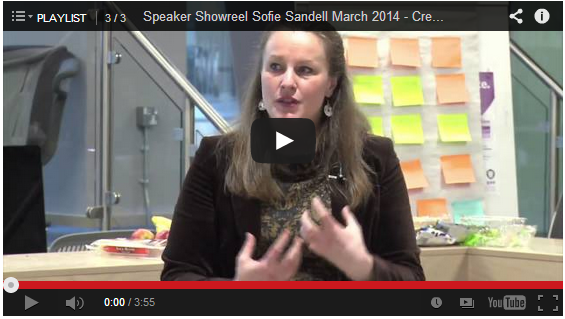 Personal branding and your digital shadow – keynote talk at UCL Enterprise Society, March 2014. Watch photos.